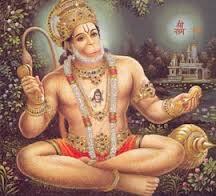 OH!LORD ANJANEYA!THE GREAT MIGHTY WARRIOR! THOU ART THE EMBODIMENT OF TRINITY OF GODS-BRAHMA,VISHNU,AND SIVA. 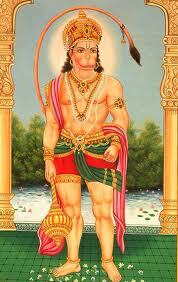 THOU POSSESSETH THE GLOW OF AN EARLY RISING SUN.I SALUTE THEE-THE DESCIPLE OF RAMA. 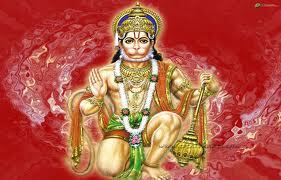 Sri ANJANEYA! 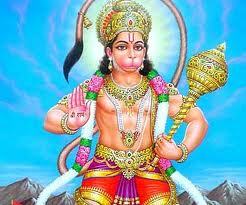 The son of mother Anjani! you are truly in the most pleasant, endearing form.YOU bless your bhaktas with fame and reputation. Oh! THE SON OF WIND-God! I bow before you. 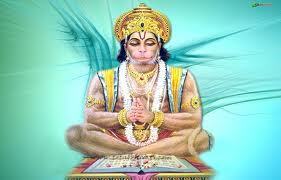 I pray to you who possesses the divine body with VAALAM(tail).You are pious and holy. I pray to you, the friend of sun-God. I pray to you,the incarnation of SIVA. I pray to you,the light of BRAHMA. Thus praising your manifold and multifarious attributes, I sing with devotion your NAMA-(name) every day and night.I describe your primordial form.I intend to praise thee in the form of a DANDAKA-(long stanza). I contemplate on your ( SUNDARA ) most beautiful and enchanting form. I am the servant of your servants.I ,too,am a desciple of RAMA.Bestow your blessings on me.Protect me from all sins.I am indeed too small to praise you and your deeds. 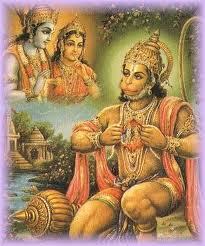 You are the proud son of ANJANA. I request you to be by my side in all troubles and turmoils.May I have your benevolent look of bliss and kindness? You guided SUGREEVA ,the monkey-king with your able,wise,and apt decisions and suggestions. You went to far off places in search of SITA(wife of RAMA) on the instructions of your king SUGREEVA.It gave solace to RAMA and HIS brother SOWMITRI (lakshmana)VAALI (brother of SUGREEVA) was slain for his cruel and wicked deeds.You reached KISHKINDHA.You went to LANKA where the demon RAVANA imprisoned SITA.Your trip to LANKA was with a specific purpose and distinct mission which RAMA entrusted to you. On reaching LANKA, you killed LANKINI ( a demon and watch woman at the gate of Lanka city) .YOU set LANKA ablaze. At last you saw Bhumija (SITA) . In ecstasy of finding Her,you handed over the RING (sent by RAMA)as a mark of identity.In turn you brought CHuUDAMANI (hair ornament of SITA) and gave it to RAMA,making Him happy. Mighty warriors like SUGREEVA,JAAMBAVANTA,Angada,Neela, -crossed the ocean through a bridge constructed by them. The vaanaraas(monkeys) with their valour, killed those demons. Enraged by this,RAVANA became furious like RUDRA (siva)and used the most powerful weapon SHAKTI on LAKSHMANA who then became unconscious and WAS laid down in a motionless condition.It is your goodness to bring Sanjeevani (life-giving medicinal plant) and made Lakshmana come to consciousness.Thus you saved his life. Demons like KUMBHAKARNA (another brother of RAVANA)lost their lives in the battle. The irrevocable RAMA BANA ultimately killed RAVANA. VIBHEESHANA was made the king of Lanka. 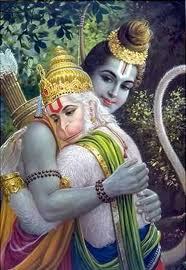 You are instrumental in re-uniting SITA & RAMA. Rama pattabhisheka (enthronement cerimony) was performed on reaching Ayodhya. There is none other than you who is so endearing to me. With utmost devotion to Rama,by enchanting your Name all sins and evils get shattered. Fears and delusions are removed. Wealth,riches,kingdom -everything-is granted if you are worshipped with deep Bhakti(devotion). Oh! 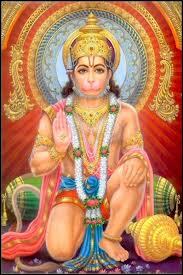 lord in the form of a monkey God!Oh!The protecter of Bhaktas!Oh! the one who is attained by the multidue of austerities,Oh!Couragious and most potential! please give us success in every act of ours. By enchanting that TARAKA MANTRA (RAMA NAMA,which redeems all sins and uplifts jeeva from the unfathomable ocean of samsara), by having firmly VAJRA DEHA (diamond-like powerful body), please reside on my toungue always making my mind filled with SRI RAMA nama, with your gigantic body pervading all the three lokas,(swarga loka, bhoo loka,and paataala loka), you meditate fully engrossed in Rama Nama, filled with Brahma TEJA (the refulgent sparkle of Brahma, the Lord of Creation), With the most ferocious, bright and furious form of a warrior, Oh! Hanumanta, with the sound of syllable " OM " , you dispell fears of evils, demons and ghosts including most wicked ghosts named " Saakini " and " Dhaakini " by Rolling them with your tail AND KNOCKing THEM TO THE GROUND by the blows of your fist and mighty arms, by breaking them into pieces with your hair baldes, you appear to be Kaalagni Rudra (Siva's angry form at the time of annihilation of the universe). By envisioning that kind of irradiant spiritual divine glow of yours I pray to you and invoke and invite you to come like an effable Narasimha! I beseech you to shower your looks of kindness on me. You are my protector! oH!MY LORD! 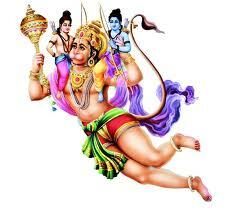 Anjaneya! I bow to thee. Oh! Embodiment of CELEBACY! Oh! the fulfiller of austirities! Oh! 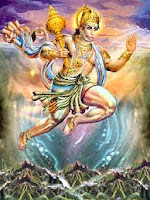 son of Vaayu (lord of Air element)! Laal Deh Laali lase, Aru Dhari Laal Langoor. 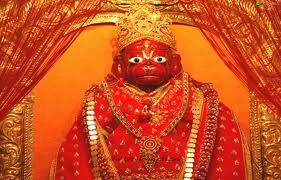 Vajr Deh Danav Dalan, Jai Jai Jai kapi Sur..
Pavan suth Hanuman Ki Jai..
Aarti Ke Jai Hanuman Lalaki. Roog doosh jakay nikat na jhankay. लाल देह लाली लसे, अरु धरि लाल लँगूर. बज्र देह दानव दलन, जय जय जय कपि सूर..
पवन सुत हनुमान की जय …. 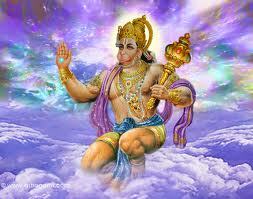 Here we are listing names and meanings of Hanuman From Hanuman Chalisa. When chanting these names, you can chant "Om" before each one followed by "Namaha" after each name. Chanchaladwala Glittering Tail Suspended Above The Head.